Do Knee Supports Help with Osteoarthritis? While there may be no known cure for osteoarthritis of the knee, there are several things you can do to reduce the strain on your joints. Common suggestions include pacing your activities throughout the day, modifying your home and work space, and walking with a stick or knee support. The question is, do knee supports help with osteoarthritis, or do they simply help to relieve the pain? This post lays bare the facts about knee supports and osteoarthritis, helping you decide whether or not they are the right solution for you. Fabric sleeve knee supports: these are usually made of neoprene, a rubbery elastic material, and are the most basic kind of knee support. They are available from most chemists, and you might have seen people wearing them for sports or following a minor injury or strain. Although not specifically designed to for osteoarthritis of the knee, they can offer some relief for those with mild forms of the condition, providing compression, warmth and support. 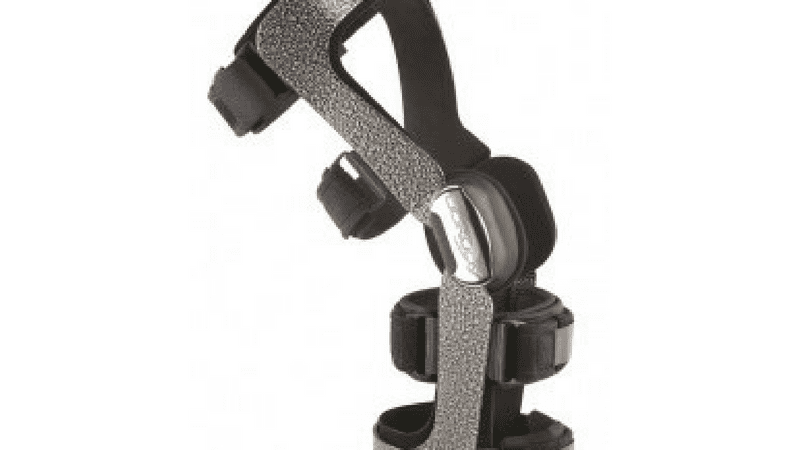 Unloader knee braces: these are semi-rigid orthotic braces made from a combination of moulded plastic and foam. They apply a gentle force to separate the affected bone joint surfaces, literally unloading the strain on the side of the knee affected by osteoarthritis. This is clinically proven to relieve pain and increase mobility, even amongst those with moderate and severe forms of osteoarthritis. So the answer to the question of whether knee supports help with osteoarthritis is yes – assuming you choose the correct type. Knee Supports and Osteoarthritis: Which Type Should You Choose? Fabric knee supports may offer some relief for those with osteoarthritis in the early stages, but fail to provide the corrective, long-term support given by unloading orthotic bracing. Fabric sleeves need to be very snug to offer any kind of benefit, and will slip and bunch around the knee, especially behind the knee, if they’re too loose. On the other hand, if they’re too tight they can end up being too restrictive, further limiting mobility and increasing discomfort. If choosing a fabric knee support, you should therefore make sure you choose one of high quality. Your local orthotic company will have some good recommendations. Whatever stage of arthritis you have, an unloading brace will provide the benefit of a longer term solution. An unloader knee brace reduces the amount of wear and tear on the affected joint, allowing the inflammation to settle, reducing pain and extending the life of the affected knee joint. So, unloader knee braces don’t just offer pain relief but can also help to slow down the degeneration of the knee joint, in turn delaying the need for surgery. You can continue to participate in everyday physical activities with reduced pain and discomfort, without compromising on their intensity or endurance. For further advice regarding knee supports and osteoarthritis, or to book an appointment with an expert Orthotist, contact Technology in Motion on 0330 100 1800. We can help you find the best solution to suit your lifestyle, enabling you to return to your everyday activities with confidence.